A team of researchers led by LMU physics professor Immanuel Bloch has experimentally realized an exotic quantum system which is robust to mixing by periodic forces. 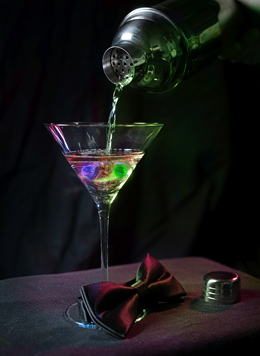 When James Bond asks the barkeeper for a Martini (“shaken, not stirred”), he takes it for granted that the ingredients of the drink are miscible. If he were to place the order in a bar in the quantum realm, however, Agent 007 might be in for a surprise! For a research team around the physicists Pranjal Bordia, Professor Immanuel Bloch (LMU and Max-Planck-Institute for Quantum Optics) and Professor Michael Knap (TU Munich, Physics Department and Institute for Advanced Study) has now prepared a form of quantum matter that is robust to shaking – a property that would make life difficult for cocktail lovers. In fact, the problem with quantum matter normally lies in its very sensitivity to perturbation: The action of even weak oscillatory forces typically has drastic consequences in the long term and is expected to dramatically alter its initial state. Therefore – up until now – it had been widely assumed that quantum systems should normally be susceptible to mixing, since shaking injects energy into the system, and should cause it to heat up indefinitely. But the Munich group has now experimentally characterized an exotic quantum state that does not behave in this way: When subjected to a periodic force, its constituents do not mix. The researchers first cooled a cloud of potassium atoms to an extremely low temperature in a vacuum chamber. They then loaded the ultracold atoms into an optical lattice formed by counter-propagating laser beams that generate standing waves. Such a lattice can be thought of as a network of energy wells in which the atoms can be individually trapped, like the eggs in an egg carton. “In addition, we were able to introduce disorder into the lattice in a controlled manner by randomly altering the depth of the individual wells,” says Pranjal Bordia, first author of the new study. By this means, the potassium atoms could be localized in special areas of the network, and were not evenly distributed within the lattice. The physicists then shook the lattice by periodically varying the intensity of the laser light. But the system turned out to be so stable that the localized groups of atoms did not mix. The potassium atoms were tossed about somewhat, but their overall distribution in the lattice remained intact. The experiments confirm recently published predictions relating to a specific class of quantum systems in which disorder actually serves to localize quantum particles. Moreover, the observation that this newly realized exotic quantum state remained stable for an unexpectedly long time is supported by the results of subsequent high-performance numerical simulations. The experimental demonstration of this quantum system could have practical consequences for efforts to develop robust quantum computers, and studies of exotic quantum states promise to yield new insights into fundamental issues in theoretical physics.